Flying in from Mexico and Louisiana by the hundreds, the Lark Buntings arrive with the females in their striped brown plumage and the breeding males in gleaming black. The rear ranks of birds flutter continuously to the front, and the entire assembly rolls over the greening land like some marvelous wheel. The splendid male often sings in flight, rocketing upward. The female, however, is less exuberant than her male counterpart, and is content to sit and incubate her nest of pale blue eggs. As legend has it, long ago in Rome when someone saw the quaintly-shaped, five-spurred Columbine, his lively imagination pictured five little doves perched on the rim of a dish feeding together, so he named the flower columbina, from the Latin columba, meaning "dove." The five petals form funnels, each ending in a slender, upward-curving spur. These spurs contain nectar, and short-tongued insects sometimes nip holes in them to collect the sweet juice. Columbines grow wild in many places, and many varieties of different colors are cultivated in gardens. 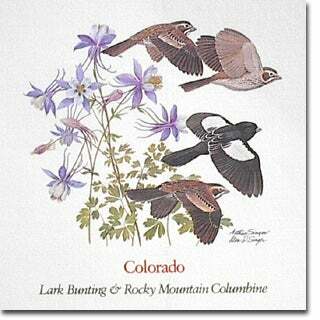 Colorado Wildflower - Moss Campion Art from the 50-stamp series, State Birds and Flowers, issued April 14, 1982 simultaneously in all state capitals.